Today I found out how glow in the dark stuff works. Glow in the dark products all contain some type of phosphor. Phosphors are any substance that radiates light after being energized in some way. There are literally thousands of chemicals that are phosphors. 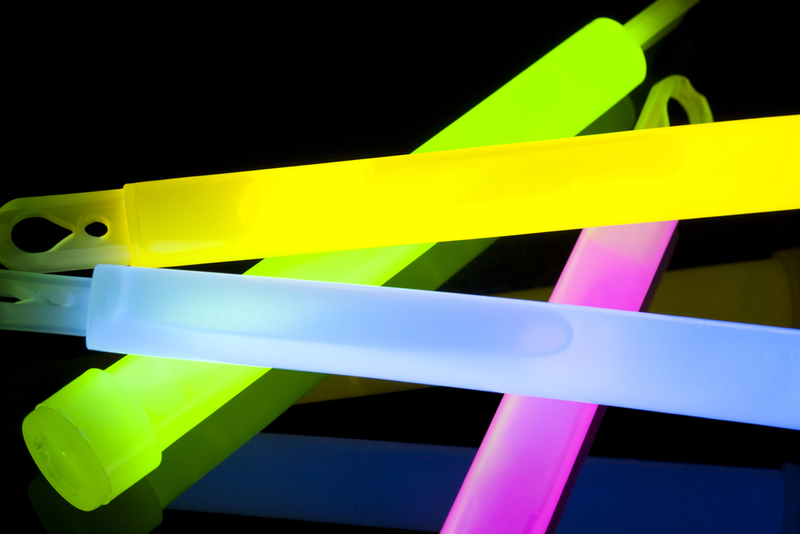 These chemicals all have varying degrees of brightness, color, and length of time they glow after being energized. There are three main types of ways these phosphors end up getting energized. The first group, which is most common for glow in the dark items, is made up of phosphorescent items; the second group is made up of chemiluminescent items; and the third group is made up of radioluminescent items. Phosphorescent glow in the dark items are things like the glow in the dark stars many people put on their ceilings. These items will absorb light radiation and will later re-emit that stored light energy over some period of time, at some level of brightness. So the best phosphorescent glow-in-the-dark items will be able to store quite a bit of this light and will emit it back out later relatively slowly, so it glows longer, not blowing its wad all at once. More technically speaking, with most items that absorb and re-emit light, this process happens extremely quickly at something like 10 nanoseconds to absorb and emit. In this special case of phosphorescence, the absorbed light energy transitions to a higher energy state, usually to something called a “triplet state”. Because of this, the energy can get trapped in this triplet state and will take time to return to the lower energy state. In certain phosphorescent compounds the lifetime of the triplets can last minutes or even hours, allowing these compounds to effectively store light energy in the form of slowly degrading excited electron states. So basically, the longer the triplet lifetime, the longer it will glow, and vice-verse. Another class of glow in the dark items are the chemiluminescent variety. These items glow because of some chemical reaction taking place. Generally speaking, these will have two chemicals that interact to release energy and will also have some sort of fluorescent dye that will convert this energy (usually energy in the form of UV light) into light that is in a light spectrum humans can see; the visible spectrum. The most common chemiluminescent glow in the dark item is the glow stick. Inside a glow stick is a sealed glass vial containing some chemical. This is enclosed inside the plastic glow stick container that contains a different chemical and a fluorescent dye. In order to get it to glow, you crack the glass vial inside, which releases the chemical it contains; this then mixes with the chemical in the outer plastic container. When the two chemicals mix, it causes a chemical reaction that produces energy that then is converted by the fluorescent dye to visible light that is not produced by heat, chemiluminescence! The color of the light put off is determined by the fluorescent dye. Even though the light is not caused by heat in chemiluminescence, heat does effect it, as anyone knows who’s put a glow stick in a freezer. What’s happening here is that the chemical reaction ends up slowing down as the molecules cool. This will make for a dimmer glow that lasts longer. On the flip side, you can put a glow stick in boiling water and you will see it gets brighter as the chemical reactions happen faster, but won’t glow nearly as long. *Note: chemiluminescence is seen all over the place naturally in living things like fireflies and various sea life. When chemiluminescence occurs naturally in biological creatures it is called Bioluminescence. Interestingly, the firefly has the highest known quantum efficiency (88%) for any chemiluminescent reaction. The least common group of glow in the dark items is the radioluminescent group. However, you will still see these from time to time. This class of glow in the dark items works by taking some phosphor and mixing it with a radioactive element. The radioactive emissions then energize the phosphor continuously for the entire life of the radioactive element. You’ve probably seen certain expensive watches that have hands that glow using this method. The three most common radioactive materials used here are radium, which has a half-life of 1600 years; tritium, which has a half-life of 12 years; and the man-made promethium which has a half-life of about 3 years. Bonus Fact: The study of phosphorescent materials led to the discovery of radioactivity in 1896. How Do Light Sticks Work? How Does Glow in the Dark Stuff Work? How Do Glow in the Dark Stars Work? Interesting! I had always wondered how the sights on my Glock continued to glow after being stored in a pitch black gun safe for months on end. As it turns out, radioluminescence is the answer. Thanks! Another interesting thing is how neon or fluorescent pigments work (like in highlighters). They don’t glow, but clearly look different from normal pigments. It’s because of the shape of the dye molecules; unlike normal ones, they are a “squashed” shape that reflects UV light in a way that can be absorbed by the human eye. I just wanna know if those glow-in-the-dark stickers reflect light.